Flying Lessons and Other Stories, edited by Ellen Oh. Grades 4-8. Crown Books for Young Readers, January 2017. 216 pages. Review copy purchased because I couldn't wait for my library to get it in! Sometimes a book of short stories is just the thing. Sometimes you're really busy, or you have a lot on your mind and your attention span isn't that long. Sometimes it's hard to stick with an entire novel or you keep starting books and putting them down and never finishing them. And in that case, a book of short stories might be just the thing. 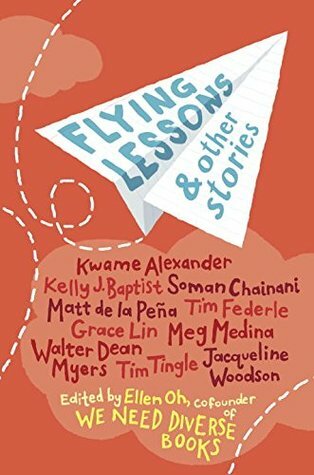 Flying Lessons and Other Stories is a collection of diverse stories from a lot of superstar authors. This book begins and ends with stories about basketball, but that's not all you'll find in this book. There are also stories about being captured by pirates, about having a crush on the new kid in school, about Big Foot terrorizing a family of campers, and more. So if you're ever in the mood to read just something short and quick, or if you're very busy and need something you can pick up and put down a lot without losing your place, try this book of short stories Flying Lessons and Other Stories. Whether it's for your library shelves, your classroom, or your home collection, this first anthology from the We Need Diverse Books crew is an essential addition. Here lie stories from a collection of amazing authors including Kwame Alexander, Walter Dean Myers, Grace Lin, and more. But my very favorite story in this book was the short-story-contest-winning The Beans and Rice Chronicles of Isaiah Dunn by Kelly J. Baptist. She painted a portrait of experiencing homelessness that was so poignant I can't stop thinking about it. I really hope to read more from her very soon (the bios in the back of the book mention a YA novel-in-progress, so I'm waiting here..!). On a side note, I've been in kind of a reading slump since the 24in48 Readathon and I haven't been finishing very many books. This was the first book I'd finished in A WHILE, and I think it's because of the short story format. That's why my booktalk spoke to that, and I think short stories have much to offer busy kids struggling to find the time to fit in reading, too.